The United States' Space Based Infrared System (SBIRS) program supports missile early warning, missile defense, battlespace awareness and technical intelligence mission areas. Think of it as "Star Wars: The Force Awakens" — but for real. The United States Air Force Space Command's ninth Schriever Wargame, which took place from Dec. 11 through Dec. 17 at Schriever Air Force Base in Colorado, might not have had all the silver screen hoopla of the Galactic Empire, Jedi Knights and other components of the "Star Wars" universe, but there were some familiar themes. The goal was to sharpen the skills of space warfighters, and to figure out ways to deal with, as well as de-escalate, the prospect of space conflict in the future, Air Force officials said. About 200 military and civilian experts from more than 27 U.S. government agencies (including NASA), as well as from Australia, Canada, New Zealand and the United Kingdom, took part in the Wargame. Examining how to apply future capabilities to protect the space enterprise in a multidomain conflict. "This is the 15th anniversary of the Wargames," said Executive Wargame Director Jason Altchek. The first game was played in late 2000 into early 2001, he said. The game has gone from a biannual $2.2 million event to an annual exercise, Altchek said — a unique affair given its strict focus on space and cyberspace warfare. "Having the allies as participants in the game has really been a big plus," Altchek told Space.com. "As a group we can accomplish a lot more than as a singular organization. That's one of the big highlights … solving some of these space and cyberspace issues." 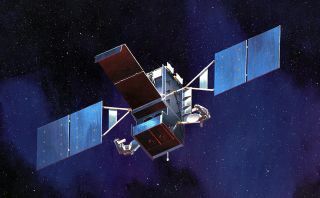 The United States' Geosynchronous Space Situational Awareness Program satellites reside in near-geosynchronous orbit. From that location, they have a clear, unobstructed and distinct vantage point for viewing resident space objects without the interruption of weather or the atmospheric distortion that can limit ground-based systems. This year's scenario envisioned a competitor nation seeking to achieve strategic goals by exploiting the space and cyberspace domains. The futuristic scenario included full-spectrum threats across diverse operating environments that challenged civilian and military leaders, planners and space system operators, as well as the capabilities they employ. "We learned a lot of things … we can't go into those because they might get classified," said Col. Michael Angle, Chief of Training at the Weapons and Tactics Division at Air Force Space Command headquarters. Altchek said the lessons learned during war gaming are invaluable. "War games are played in the future. They are not exercises which are played in the here and now," Altchek said. "We look into the future so we have the opportunity to guide it slightly different in a better fashion." How difficult is it to project out to the year 2025, in terms of the scenarios and technologies that a hostile entity could use in space? Altchek said that the war-gaming community uses a technique called "backcasting," which relies on rigorous analyses to determine technological feasibility. Secretary of the Air Force Deborah James arrives for the Schriever Wargame debriefing on Dec. 17, 2015. She is with Major Gen. David Thompson, Vice Commander of the Air Force Space Command. "We do that so we don't fairy dust or 'Buck Rogers' things … that's another way to say it," Altchek said. "Backcasting is the way we try to avoid any of the non- or unbelievable products that would come out in that time." Angle told Space.com: "What we're trying to do in space is to understand the threats that are out there … understand the environment that we work in, and get all that information to the decision-makers so in a hostile environment they know what's what." Secretary of the Air Force Deborah James was debriefed about results of the ninth Schriever Wargame shortly after the exercise's completion, officials said. Schriever Air Force Base is named in honor of retired Gen. Bernard A. Schriever, who is recognized as the father of the Air Force's space and missile program. Schriever passed away on June 20, 2005.